Examples, videos, activities and worksheets that are suitable for A Level Maths. How to Integrate Exponential and Natural Log Functions? 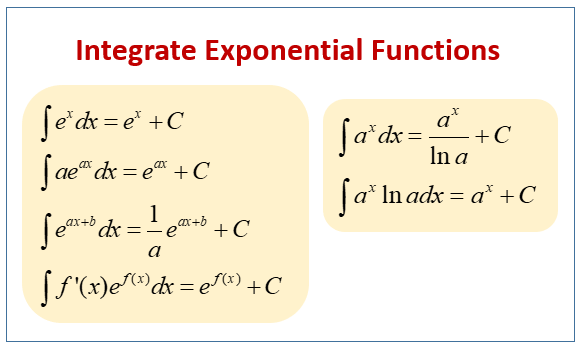 The following diagrams show the integrals of exponential functions. Scroll down the page for more examples and solutions on how to integrate exponential and natural log functions. This is the second part of the full tutorial on integrating functions of the form f'(x) ef(x). In this tutorial you are shown how to integrate fractions of the form f'(x) / f(x). These integrals lead back to natural log types.